A regular gym workout might not be the exact thing you’d love to do this blazing summer heat to keep yourself fit, especially when you’re beginning out. Yoga, on the other hand, might just be the right beginning to attain physical fitness with a bonus of mental peace. The most important advantage of yoga is that it is suitable for all ages without worrying about other health concerns. 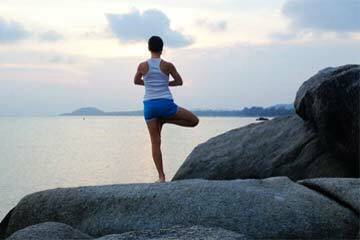 Yoga aims at keeping you fit and improving your flexibility, even so, its key goal is achieving mental peace. Thus, self-awareness becomes an important factor as yoga isn’t just regular gymnastics but much more than that. Yoga is an age-old system that intents at enhancing one’s well-being and self-awareness. It is important to be sensitive and emphasize on feeling a posture instead of its appearance. The individual should be willing to accept the mistakes, as mistakes are part of the learning process. The more mistakes to catch and try to improve, the better you’ll learn. Yoga should be approached with an intrinsic sense of delight and pleasure. Smiling with your teachers and companions boosts the vigor inside you and helps you bring the best from within. Yoga is not really a sports; especially not a competitive sports. Hence, being helpful and compassionate towards others goes a long way. You must make sure that once you begin yoga, you practice it on a regular basis. Also, you must explore different styles and poses regularly based upon your requirements. You must keep patience as learning something new may come slowly, but once you learn it the joy is immense. Paying attention to correct method of breathing is essential, as it comprises an obligatory part of yoga. Once you make note of these minor but vital points and stick to them, you would be able to keep your mind at peace and fitness at peak with yoga.